This is completely off-topic. It has nothing to do with writing, or fighting, or wrestling with inner demons or any of the usual fare. What it does discuss, is motherfucking coconut. Last year my work appeared in a dark fairy tale anthology, and I decided to reach out to some of the other authors in the book. As it turns out, one of them was my neighbor. 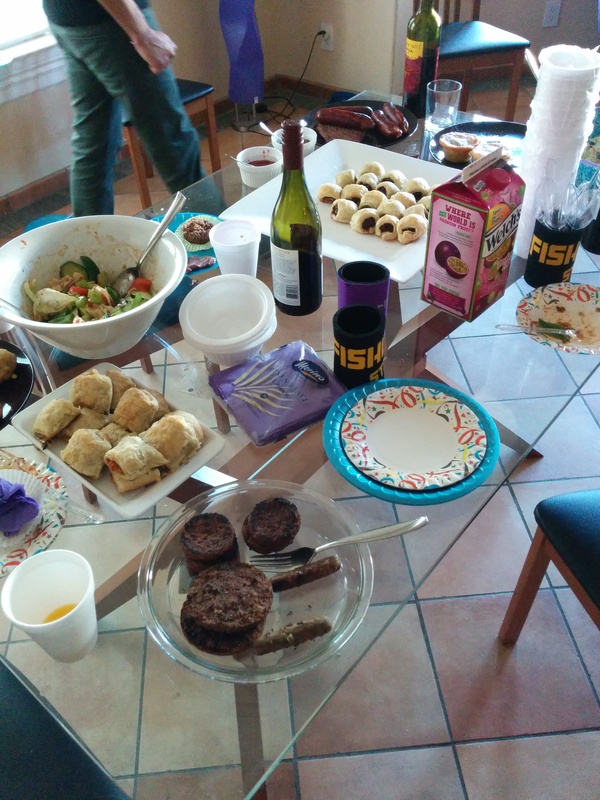 She invited me to an Australia Day party, and we spent a delightful afternoon swilling yellow-tail and eating several kinds of meat-in-pastry with a bunch of ex-Pat ozzies. My family is all far away, and it was heartwarming to see several families coming together, feasting, watching their kids run and scream and spill crumbs everywhere, and generally having a marvelous time. It’s fascinating to see the relief people experience when they’re finally among their own. Complete strangers can bond instantly once they’ve found a common context. Perth. Tony Abbot’s a bad man. Invasion Day. UWA. Oi oi oi. And then there were Lamingtons — I’m pleasantly disposed toward the lamb-like because lambs are delicious. Also my truck is named Lammykins, because it’s a ram, har har. It turns out that these are the #1 go-to fundraising bake-sale item down under. My hosts told stories of huge production lines where one group would bake, another frost, another roll in the coconut to produce five tons of cake. Here I present the recipe so that I don’t lose it, and you don’t lose it. If anyone can figure out how to turn this into a mug cake, I will love you forever. Preheat your oven to 350 degrees F (180 degrees C). Butter, or spray with a nonstick cooking spray, the bottom and sides of an 8 inch (20 cm) square cake pan. Then line the bottom of the pan with parchment paper. In a large bowl sift or whisk together the flour, baking powder, and salt. In the bowl of your electric mixer, or with a hand mixer, beat the butter until soft. Add the sugar and beat until light and fluffy (about 2-3 minutes). Add eggs, one at a time, beating well after each addition. Scrape down the sides of the bowl as needed. Add the vanilla extract and beat until combined. With the mixer on low speed, alternately add the flour mixture (in three additions) and milk (in two additions), beginning and ending with the flour. Spread the batter into your prepared pan and smooth the top with the back of a spoon or an offset spatula. Bake in preheated oven for about 20 – 25 minutes, or until a toothpick inserted in the center of the cake just comes out clean. Cool the cake in the pan, placed on a wire rack, for about 10 minutes. Then place a wire rack on top of the cake pan and invert, lifting off the pan. Remove the parchment paper and then turn the cake right side up. Once the cake has completely cooled cut into 16 – two-inch (5 cm) squares. Chocolate Frosting: Place the powdered sugar, cocoa powder, butter and milk in a heatproof bowl placed over a saucepan of simmering water. Stir the mixture until it becomes smooth and of pouring consistency. (Alternatively, you can place the squares of cake on a wire rack that is placed on a large baking sheet. Then pour the frosting over the top of each cake, letting it drip down the sides. Some of the frosting may drip onto the baking pan. Pour this frosting back in your bowl and reuse (strain if necessary). Makes 16 2-inch (5 cm) Lamingtons. Lammy Lammy Lammy, oi oi oi! 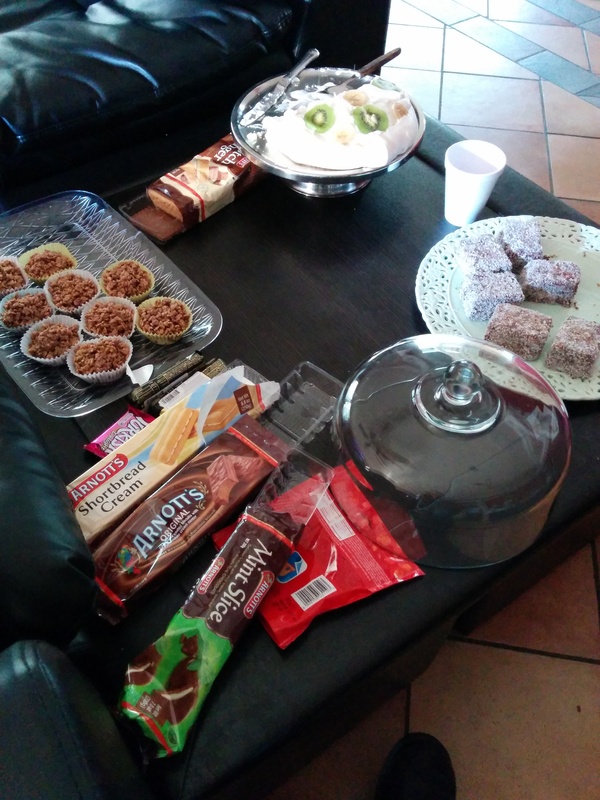 This entry was posted in This Really Happened and tagged australia day, cake, community, happily never after, invasion day, lamington cake, recipes on January 26, 2015 by Setsu.